I made this gluten-free so that our whole family could share it, but I've used this same recipe with regular white flour and it's perfect that way too. No matter how you choose to make it, enjoy! Preheat the oven to 350F. In a bowl, mix the egg, milk or milk substitute or water, and oil, until they're well-mixed. Add the flour, baking powder, sugar, xanthin gum (if you're using it), salt (if you're using it), and Dari-Free (if you're using it). Stir gently, about 40 strokes. Add in the white chocolate and hazelnuts, and stir until they're well mixed. Pour into a 9x5 or 8x4 loaf pan. If you're using gluten-free flour, at this point ideally let the loaf sit unbaked for 10 minutes. Bake for 55-60 minutes until fully set and golden. Cool on a rack, then enjoy! 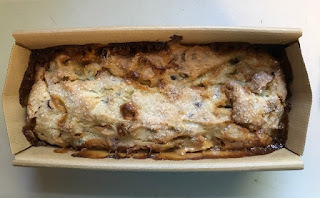 This is excellent for several days, in fact like most quick breads it's even better the second day than the first. I haven't been blogging at all because my thoughts have been more quick notes that I've put on Facebook, but I have been trying to keep busy (my bigger problem is that I wind up making myself less busy than most people but too busy for my own mental abilities). I've been caring for the family, taking walks, baking, and crafting. I finally have something appropriate to share here though! I've just finished this Sukkos Challah cover. It's a kit from Jerusalem Embroideries on Etsy. It's all hand embroidered. The outer rectangles are worked in double knot stitch; the names of each of the ushpizin (guests) are worked in simple back stitch. 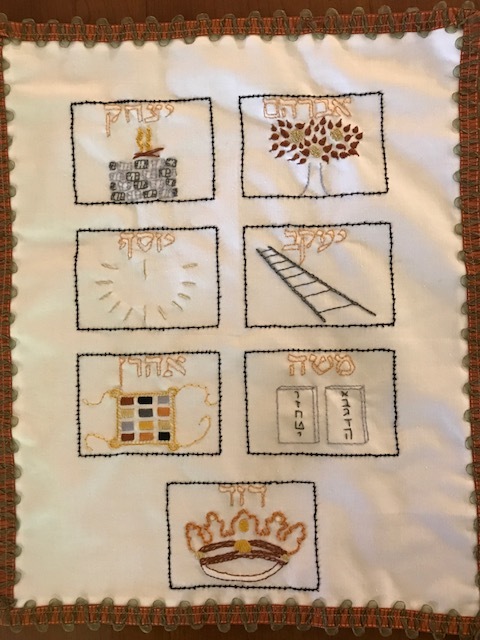 Abraham is symbolized by a fruitful tree; the trunk is in outline stitch, the leaves in satin stitch, the fruit are clusters of French knots. 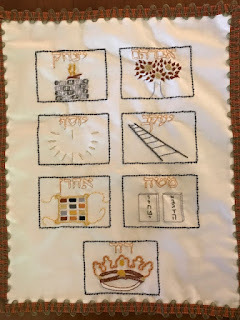 Isaac is represented by an alter; the alter stones are worked in blanket stitch, the burning sticks are just interwoven long stitches, and the flames are chain stitch. Jacob is a ladder; the long posts are chain stitches and the cross hatches are back stitched. Joseph is sheaves of grain, his brothers' which bowed to his. This is a little complicated to explain, but I worked one long straight stitch for each, then worked a tiny stitch over each end and the center of that stitch, then wrapped each long stitch with four wraps. Moses is the tablets of the law; the outlines are back stitched and the letters aleph to yud are just worked in plain stitching. Aaron is shown by the priestly breastplate. It's outlined in blanket stitch, the stones are each satin stitched, and the fringes are just back stitched. Finally, David's crown is worked mostly in chain stitch, with shadow stitch for the back of the crown rim, and satin and back stitch for the gems. I backed it with brown polyester satin fabric and added trim around the edges. It was a nice project and worked up fast. My only complaints about the kit are that there wasn't enough floss in several colors (I had more in my stash or similar colors I substituted for what came kitted); the names of Abraham and Aaron aren't properly centered; and the whole piece was slightly off square, which made it harder to do the finishing. I'm very happy to have it done in time for the holiday. A week and a half ago I got home from a round-trip two-week visit to the John C. Campbell Folk School. Two weeks was not long enough and yet a little bit too long. I was not as prepared for being social, being in an intensive learning environment, and being on a different schedule as I'd hoped I would be back when I planned the trip. 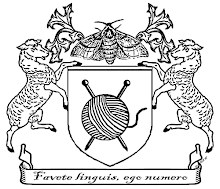 I still benefitted greatly; I returned home calmer (though the 10 hour drive home was exhausting, especially given that it ends with DC area traffic) and I learned both how to weave rag rugs and that willow baskets are ridiculously complicated to weave. I wove 2 rugs and a bag, and I made 3 baskets. I also experienced some serious anxiety being out of my element and stretching myself so far. While I was there I bought a great bread baking book, as much because I just wanted to read it as for the recipes. It's "Bread Making: Crafting the Perfect Loaf from Crust to Crumb," by Lauren Chattman (Storey, 2011), and I really learned a lot about what I can do with dough. I've baked 4 recipes from it now, including today's successful attempt at 100% whole wheat hazelnut bread, which rose high and developed a perfect crust. As for my mood, well that goes in circles too. Highs and lows (my highs are only barely nearing what's normal for most people, but for me it's new compared to the last few years. I truly wish I were a psychiatrically normal person. I'm hoping I can carry some of the calm of the trip to the folk school over for a few more weeks. I don't have any Passover loaf pans and I hate buying dozens of disposable pans. I do have a tube pan, many of us do, since sponge cakes are so ubiquitous for the holiday. So I adapted a recipe until it works perfectly with a standard 10" tube pan and a baking sheet. 1 T cinnamon OR 1 C chocolate chips or whatever else you want to add in. Preheat oven to 350F, grease tube pan lightly. Mix eggs and sugar in a bowl. Add all the other ingredients and mix well (if using chocolate chips, add all the other ingredients, mix the batter, then add in the chips and mix a little more). Pour the mixture into the tube pan. Bake for 35-45 minutes, until fairly well set. The length of time will depend on the exact settings of your oven, the exact size of your pan, and what it's made of, but you want the mixture to have set well without burning at the edges. Invert the tube pan onto a baking sheet lined with parchment paper or else greased. Slice the ring of cookies into thin wedges, 1/2-3/4" wide if possible (if they fall apart, slice them wider). Place each wedge on its side on the baking sheet. Bake for another 10-12 minutes until they're dry and solid. They'll harden more as they cool, so don't worry about shooting for completely hard in the oven. Remove them from the baking sheet using a spatula and cool them on wire racks. These also freeze well. I don't know how else to describe it. I'm not intensely depressed. I'm not anxious. I'm just spacey. I can't remember things from one moment to the next. I can't track what I've been told. I'm constantly surprised the last few days how much time has elapsed because I've totally lost track of it, which is not like me at all. The sum total of all my crafting in the last week is this one hat (which normally I would have finished in a single half day but which took me from Monday to Sunday), and about half of a warp measured. I really don't know what to do. I can't quite concentrate, I can't seem to do much. I can still do basic rote tasks like cooking dinner, that's so ingrained it works. I can track some things in my mind. I'm just noticeably impaired and it's getting to me. If you know where I actually am and what I'm doing, please let me know. Thanks. I see other people able to verbalize their experiences, so I know it's generally possible. I don't seem able to put into words my mental illness, my physical pain. Mind you, I'm appreciative that both are only moderate right now, I've certainly been much more mentally ill at times and the physical pains I'm just having to live with right now (I guess I'm keeping the manufacturers of naproxen sodium in business). I have all sorts of intimate, extraordinary, eloquent thoughts but they simply don't translate to the written (or spoken) word. I don't have a way of knowing if it's a problem with my use of language or with human expression itself. It leaves me uneasy, uncertain as well as disappointed and gives me a feeling of incompleteness. So I leave today a simple embroidery piece I just found at the bottom of a bag stuffed with embroidery odds and ends. This is sashiko style work done as finished embroidery rather than used as a dye technique; the fabric has first been dyed in indigo and then embroidered in heavy perle cotton (real Japanese sashiko is a technique of using these stitching patterns for resist dyeing). Apparently I worked this at some point last year. It's all wrinkled and tousled from sitting under an entire grocery bag full of floss, hoops, shisha mirrors, boxes, packages of even weave fabric, and so on. I don't have any idea what I'll do with it (I should add a border to it and sew it into a pillow, but that's not happening any time soon).